This is an excellent backpack for hikers and adventurers who have difficulties finding the perfect fit. 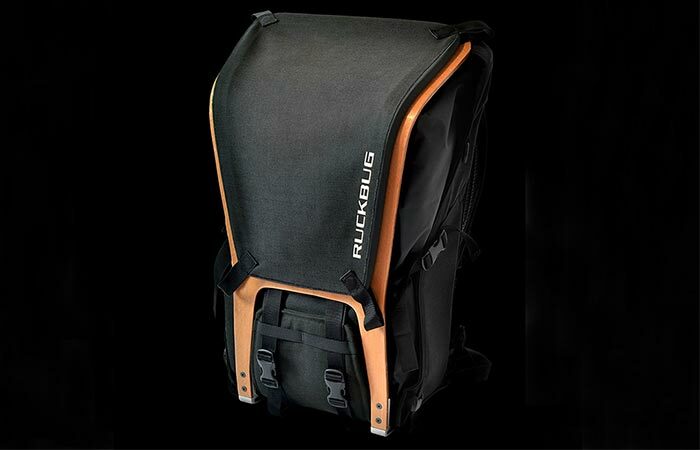 Ruckbug Urban Outdoor Backpack has sturdy protective feet to make it stand. In the center is a wooden frame inspired by a traditional kayak structure. A large, removable lid, made from water repelling textile, covers the bag and provides full shelter from dust, dirt, rain or hostile weather. By releasing the feet and unclicking hidden adapters on the top, the frame can be removed so the bag can be much more versatile. The backplate can be used for all sorts of different necessities by simply removing the main bag and the frame from it. It is comfortably padded and pleases the back. 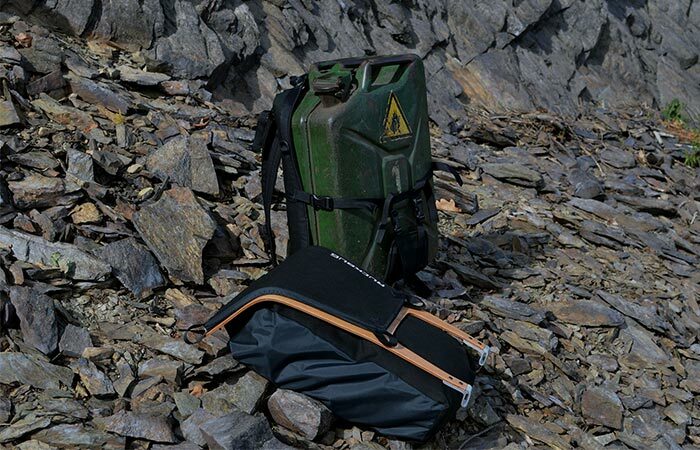 RuckBug is made for hikers, backpackers, and adventurers. It’s modular, adaptable and provides protection and easy carriage for all your necessities. RuckBug has a strong handle on the top of the backplate. Lower storage can be used to tie bulkier things, like a sleeping bag or inflatable mattress. There is extra space on both sides of the pack for everything you can’t put in the bag. It’s ideal for sneakers, water bottles or even a small axe. For stability and protection, it has a wooden frame in the center. The backpack can be detached from the carrying system and used separately. Just like we mentioned, the carrying system can be used independently by simply removing the bag. It is very dependable and you can choose to remove its ribs as well as use fully functional loops located on its tough shoulder straps. This kind of innovative design brings modularity and adaptability. Every camper, traveler, hiker or outdoor enthusiast should stand in line and wait for the release in the fall of 2017. Make sure to check out this video and see all the features of RuckBug Urban Outdoor Backpack.